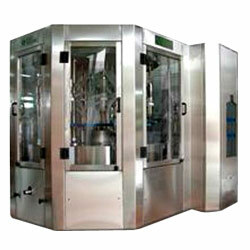 1, This equipment collects auto cover-pulling, outer bucket printing machine, uploading bottle, filling packaging, microwave capsule disinfectant machine, capsule ringing, capsule pressing, disinfecting sterilizing, lamp chek, heat shrinking film, bucket pulling machine, finished product transportation into one. 2, We adopt imported pneumatic, electric component, it brings motivity transmission with safety also stability, all measuring detection control units adopt Japanese Programmable Control (PLC), touching pad interface, highlighted (150cd/m) STNLCD display, intellectualized full auto producing is achievable to get the highest producing efficiency. High grade stainless steel cr18ni9ti and SUS304 are used in this equipments, it is novelly designed, easy to operate, orientation, which is the ideal equipment for 5 gallon water production. 8. Bottle size: Ф270x490xФ56 mm. 9. Cap size: 58x40(Tail: LxW=18x7.5) mm.